Callbacks to Carl Philip and Sofia’s wedding were found in the floral color scheme and in Sofia’s designer choice for the day. Wedding gown designer Ida Sjöstedt created this custom lace suit, continuing to prove that white is a pretty foolproof selection for a christening outfit. Princess Sofia continues to be a bit hat-averse, but there weren’t too many guests that wore anything more than a fascinator or headband. The pearl look here is a nice touch, adding some textural contrast to the ensemble. Sofia's brooch - which all the ladies of the family wore - is the King's portrait, Sweden's version of a royal family order. 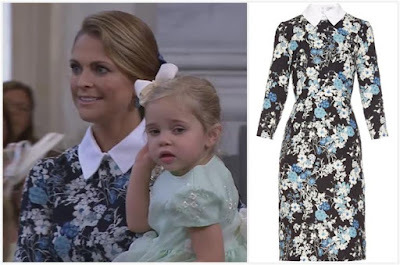 I’m still waiting for my promised sleeve-off, but given that it’s pretty obvious Chris and Madeleine have their hands full with toothbrush-chewing Prince Nicolas and squirmy Princess Leonore, I’m not surprised Madeleine opted for an outfit without anything that might get in her way. This is one stylish kid wrangling outfit, though. I love the way the sharp collar on this Erdem dress works against the softer floral motif, and accessorizing with a simple bow at the back of her updo was just right. Once again, she might be my christening best dressed. 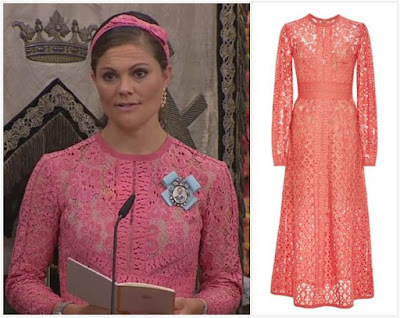 We’ve seen Silvia in soft pink for the christenings of both of Crown Princess Victoria’s children and in blue for both of Princess Madeleine’s children. New kid, new color, moving into the magenta/purple spectrum now. Could we get a nice rich purple sometime? Just putting my request in early, Your Maj. These are royal events, sure, but the Swedes also makes sure that they are family events above all. Meaning: the kids run the show! 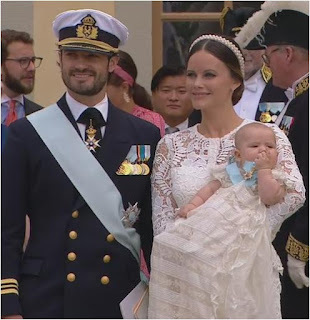 Prince Alexander was happy to display the ins and outs of an heirloom christening gown, as it was visible that it was left a little open in the back (common, since the gown has to fit multiple babies in multiple sizes). The King gave him the Order of the Seraphim, which he promptly used as a little post-baptism snack – just in case you wondered why we see the Swedish baby sashes at christenings and never again. Awwww. And that’s why we love a Swedish christening! Who's winning your awards today?